US, 1966, 116 minutes, Colour. William Holden, Richard Widmark, Janice Rule, Patrick O’ Neal, Victoria Shaw, Roger C. Carmel, Richard Rust, Arthur Franz. 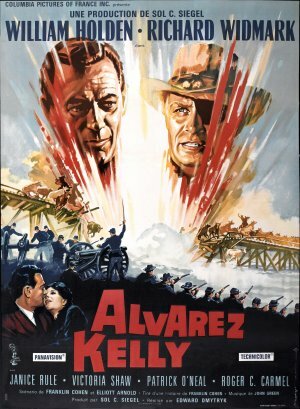 Alvarez Kelly is more of a drama than a western. It is set in the Civil War, allegedly based on a true story about cattle being moved from Texas to the east for the Union and Confederate attempts to steal the cattle. William Holden is Alvarez Kelly, born in a Mexican city, part Irish descent, who droves the cattle. Richard Widmark is a Confederate colonel. Janice Rule is his fiancée, someone who wants to leave the besieged Richmond and enlists the help of William Holden. Patrick O’ Neal is a former lawyer who is now a Union major. Australian Victoria Shaw appears as the widow who helps the South. The film is spectacular in its moments of presenting the cattle. There are many droving sequences and a final confrontation between the Union and the South. William Holden and Richard Widmark were beyond their hero days but offer solid presence. The film was directed by Edward Dmytryk who had been blacklisted and went from Hollywood after successful films like Murder My Sweet and Crossfire to work in England. However, he returned to the United States in the mid-50s and made a number of significant films like The Caine Mutiny and The Young Lions as well as a lot of popular films like The Carpetbaggers. 1.A story of the Civil War? The presentation of North and South? The need for food and cattle? 2.The Texas settings, the eastern settings? The atmosphere of Virginia in 1864? The open spaces? The city, the interiors? 3.The stars, their screen presence, their careers? 4.The opening, the cattle from Texas, Major Stedman and his arrogant stances? The demands on Kelly, the money, bringing the cattle east? The long trek, the trains? 5.Alvarez Kelly, a western hero, his story about his father in Texas, his Mexican background? The war with Mexico? His being open to all sides, the importance of the money? His being abducted by Rossiter? Their confrontations, Rossiter’s demands about the cattle, Kelly’s refusal, Rossiter shooting his finger? Threatening to shoot the rest? Kelly consenting? 6.Rossiter, hard, the loss of his eye, the relationship with Liz Pickering? His commitment to the South? Ruthless aspects? The importance of Harrison and his support? 7.Kelly, in the town, the social, dancing with the ladies, the meeting with Liz Pickering? The rivalry with Rossiter? Going to her home, shaking off his shadow? Going via the brothel? The meeting with Liz at the restaurant? His paying the money for her to take ship to New York? The observer thinking that he was paying for himself? The discussions with the Scots captain, the whisky, his running the embargos? 8.Rossiter, the confrontation with Kelly, learning the truth about Liz? The determination for the plan to succeed? 9.Rossiter and his confidence in his men, Kelly proving that they were inept, unable to control the cattle at all? The training? 10.The plan, the observations of the Union, Stedman and his understanding of the plan? Grant and his seeming refusal? His wanting the southerners to come into the trap? 11.The action of the southerners, the cattle, the bridge and its explosion, the river? Kelly and his advice? The help of Charity Warwick? The capture? The trick and the South surrounding the Union? The further attack, the fight? Kelly saving Rossiter? 12.The finale, an episode of the Civil War? The background of logistics and food compared with the battle sequences?